RayBio® Human Immunoquantitative (PCR-Based) BDNF ELISA Kit for cell culture supernatants, plasma, and serum samples. 20-25 business day lead time. The RayBio® Immuno Quantitative Enzyme Linked ImumunoSorbent Assay (IQELISA™) is an innovative new assay that combines the specificity and ease of use of an ELISA with the sensitivity of real-time PCR. This results in an assay that is simultaneously familiar and cutting edge and enables the use of lower sample volumes while also providing more sensitivity. The RayBio® Human BDNF IQELISA™ Kit is a modified ELISA assay with high sensitivity qPCR readout for the quantitative measurement of Human BDNF in serum, plasma, and cell culture supernatants. This assay employs an antibody specific for Human BDNF coated on a 96-well PCR plate. Standards and samples are pipetted into the wells and BDNF present in a sample is bound to the wells by the immobilized antibody. The wells are washed and a detection affinity molecule is added to the plates. After washing away unbound detection affinity molecule, primers and a PCR master mix are added to the wells and data is collected using qPCR. 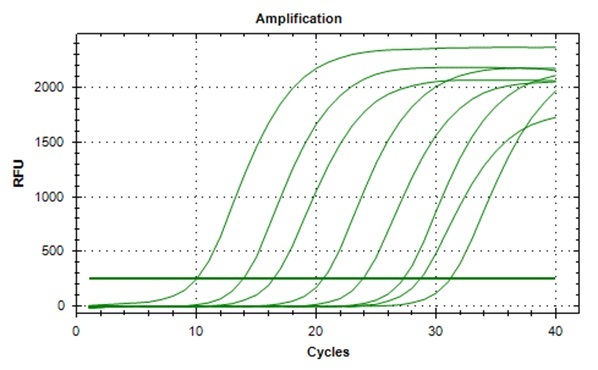 Ct values obtained from the qPCR are then used to calculate the amount of antigen contained in each sample, where lower Ct values indicate a higher concentration of antigen. May be stored for up to 6 months at 2° to 8°C from the date of shipment. Standard (recombinant protein) should be stored at -20°C or -80°C (recommended at -80°C) after reconstitution. Opened PCR plate or reagents may be stored for up to 1 month at 2° to 8°C. Note: the kit can be used within one year if the whole kit is stored at -20°C. Avoid repeated freeze-thaw cycles.